Invited by Mr. Kirby were long time County Landscape and Parks Director Clint Pittman and District 2 Commissioner Rocky Ford. On March 27, your reporter had a conversation with the co-owner of Rum 138 and water expert Merrillee Malwitz-Jipson. She explained her frustration that the County did not involve the public in the decisions regarding the renovation of Rum Island. She also mentioned that the handicapped ramp leading into the spring had not been repaired. Earlier today in a lead in to this story we ran this graphic. 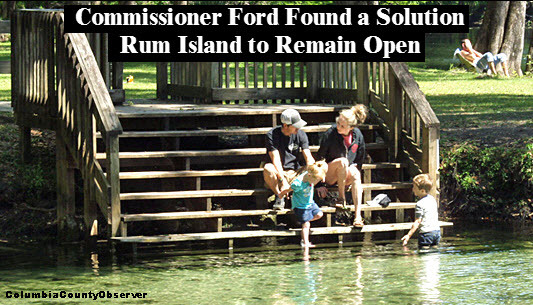 Commissioner Ford will recommend another solution. Your reporter drove down to the park. Not only was the handicapped ramp in disrepair, it was a death trap. Photos were taken and on March 28 they were forwarded to Mr. Kirby, County Attorney Joel Foreman, Commissioner Ford and others. After the photos were received by the County it was determined that Mr. Pittman would send a crew down to close off the deck, which included the handicapped ramp. Mr. Pittman's crew closed off the deck. The job was not spectacular. On Friday, March 30, the County agenda came out for this Thursday's April 4th meeting of the County Commission (the County 5). In that agenda was a recommendation by Commissioner Ford that Rum Island Park be closed beginning on April 15 due to vandalism. The park would be closed for the summer. The handicapped ramp will be repaired so the unsuspecting won't roll off the end and drown. On Wednesday morning, April 3, at about 3:00 am, your reporter reviewed the agenda and discovered Mr. Ford's recommendation. Your reporter forwarded a text message to Ms. Malwitz-Jipson advising her of Mr. Ford's recommendation to close the park. Others were also notified. At 12:54 pm, your reporter directed a public record request to Mr. Kirby and others, asking for records supporting the vandalism Mr. Ford was claiming. Mr. Kirby, who has continued the County tradition of outstanding public record compliance, called and said he was working on it. 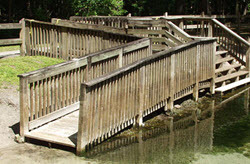 At 1:03 pm, Ms. Malwitz-Jipson sent an email to various state and county officials requesting that the Park not be closed, and that the damaged deck/dock be removed or repaired. At 1:38 pm your reporter, who is also a resident of Columbia County contacted Mr. Kirby with the following: "Kevin, no circus. A solution. Maybe you, Clint, Rocky --- we meet on the site – quietly, without fanfare and distractions. Stew"
Within 15 minutes, Mr. Kirby arranged the "quiet" meeting at Rum Island Park for 3:00 pm. Clint Pittman (left), Rocky Ford (center), Kevin Kirby (right). 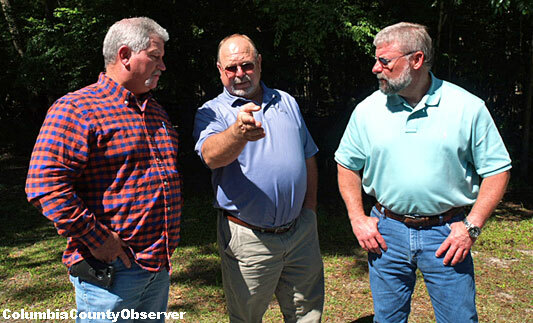 Commissioner Ford points out a way to repair the handicapped ramp and deck as Mr. Pittman and Mr. Kirby listen. At about 3:05 pm Mr. Kirby, Mr. Pittman, and Mr. Ford arrived at Rum Island. We walked over to the deck in question. The decking will be repaired. Mr. Kirby said he heard from the state. The grants the County was utilizing to renovate the area around the spring, the bathroom, and the boat ramp would still be available in the fall if the County wanted to postpone the renovations. Mr. Kirby asked Mr. Pittman if the deck could be repaired for use during the summer. Mr. Pittman said his crew could handle it. 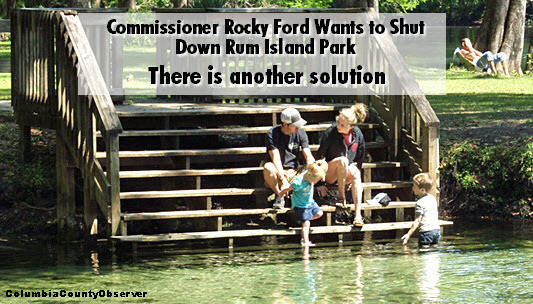 Mr. Ford said he was going to recommend to the County 5 tomorrow night that the park not be closed until the fall; that the deck could be repaired and that the handicapped ramp would be accessible; and that the renovations in Rum Island begin in the fall. Mr. Kirby will be making a presentation tomorrow night. It is said that if you saw how sausage was made, you wouldn't eat it. This time, Mr. Kirby picked up the pieces, ran with them, and the sausage came out pretty good. It looks like after tomorrow night, folks will be assured of being able to enjoy a touch of nature during the summer at Rum Island Park.